(From left) TR Luat, TR Ilie, Larry and Teng at the gathering. KAPIT: A few hundred people attended DAP Bukit Goram branch gathering (randau ruai) at Rumah Nuang Unging, KM2 Jalan Bukit Goram here recently. 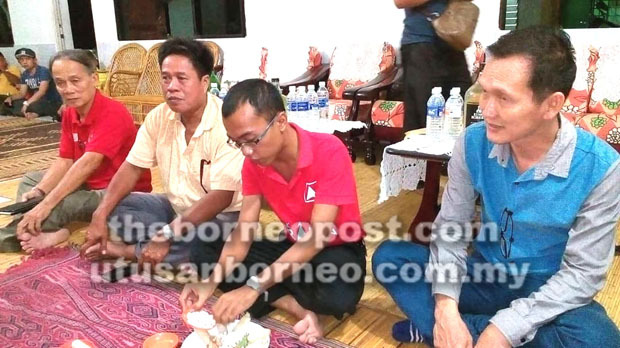 Residents of nearby longhouses also came including their respective headmen such as TR Ilie Akin, TR Luat Achang and TR Mary Masing. Chairman of DAP Sungai Kapit Teng Mee Hing was also present. 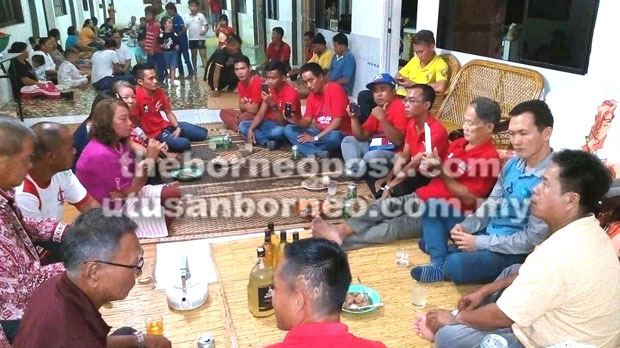 Protem committee chairman of DAP Bukit Goram, Larry Asap, said the gathering was a great breakthrough of sorts for the party because it was the first time it was attended by so many people, including the headmen. Larry said in the past DAP functions here were rarely attended. Very few came. Larry also told the gathering that the PH government advocated the freedom of speech and opinion, and also accommodated different political opinions. Commenting on the PH manifesto, Larry said more time should be given to allow the government to meet them taking into account the country’s financial position. A section of the crowd at the ‘randau ruai’ gathering.